Starting out in oil painting need not mean purchasing lots of art materials. With some guidance, money can be saved on needless pigments or art gadgets. The secret is to purchase only what is essential and also the most mobile. This will come in useful when starting an oil painting course. There is a confusing choice of art pigments that can be used for art class, but not all are needed. In fact, many colours are redundant, such as orange, skin tone and grey. Regardless of whether the class focuses upon landscape, portraiture or abstract, a few pigments will cover most needs. Small 37ml tubes (with a larger tube of white, say 100ml) will be easy to carry. 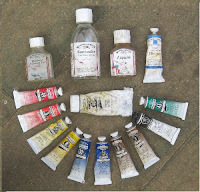 The following pigments will come in useful, as these include the primary colours: titanium white, ultramarine, pthalo blue, lemon yellow, cadmium yellow (pale), permanent rose, cadmium red, burnt umber and burnt sienna. Additional pigments can be added at a later stage: viridian, cerulean blue, cobalt blue, carmine red, alizarin crimson, quinacridone violet, vermillion, Indian red, lamp black. What are the Main Types of Oil Paint? It is recommended that beginners purchase student quality oil paint as the artist quality is costly. Student quality oils provide high performance in regards to tinting strength and coverage; the main difference is that the artist quality oils comprise traditional sources of pigment as opposed to synthetic. 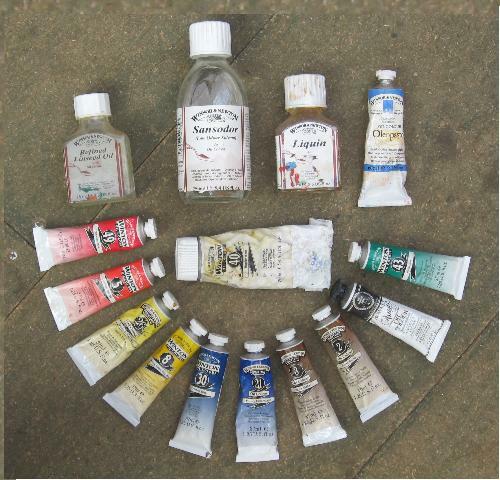 Purchase only tried and tested producers of oil paint such as Winsor & Newton or Daler Rowney. Water based oil paint such as Artisan can be used if the user is sensitive to solvents associated with oils. Water soluble oils can be thinned and cleaned with water instead of solvents. Sable brushes or a blend of sable and synthetic are ideal for oil painting. Bristles that are springy to the touch would be suitable for detail and blending. Ox hair (or similar stiff brushes from DIY stores) would be suitable for impasto techniques or ladling on large areas of paint. Art brushes come in various sizes and shapes. Several at one’s disposal will enable the mixing of different colours without having to repeatedly wash the brushes in spirits. Brushes come in various sizes that are designated by numbers; the larger the number, the larger the brush. Sizes 00, 3 and 6 should satisfy all needs for fine detail. Sable ‘rounds’ (bristles that taper to a point) will provide a fine line. Filbert or ‘flat’ describe bristles that create wide brushmarks. Sizes 10, 12 or larger would be suitable for applying large areas of paint and for glazing. With this in mind, only a range of 6 brush sizes or so would be needed to create an array of marks. As oil paint is oil-based, special solvents are needed for cleaning the brushes and thinning the paint. Some solvents can be smelly, not ideal for work in an enclosed space. For this reason, turps or industrial spirits should not be used. Low odour artist’s spirits such as Sansador are kinder to the brushes as well as the senses. A jar of Sansador could last years if used solvent were left in a jar to settle and then the clear solution siphoned off into another jar to be reused. Linseed oil can be used to thin the oil paint into an oily wash, which makes the paint runny and provide gloss. Other art mediums can be experimented with, such as alkyd mediums which accelerate the drying time of oil paint and also impasto. For health and safety, place such solvents into small jars with a secure lid. A variety of art surfaces can be used for oil painting. For compactness, an oil sketching pad can be found in art shops. This works out cheaper than purchasing numerous canvases and also saves on space. Oil sketching pads comprise sized paper with a light, canvas texture. Alternatively, art boards can be purchased in various sizes and textures. Art boards are simply cut card which has been primed for oil painting. To cut on cost, preparing your own art surfaces can be a satisfying experience. Simply purchase a tin of good quality gesso primer, which is a water-soluble white paint that can be applied straight into wood, card or paper. The primer dries water-resistant but brushes can be cleaned in warm water afterwards. Some artists use oil based primers or prepare their own gessoes with warm glue and gesso powder. However, the use of acrylic primer gesso makes priming art surfaces a lot simpler. Mixing oil paint on a palette need not mean the purchase of specially-treated wood. An old saucer or Cling Film over a piece of board would be suitable as a mixing palette. In fact, any non porous material would be suitable. Rags will come in handy for wiping the brushes dry. But how can all these items be ferried to class? Some artists like to use a pochade box or similar for storing and transit. I use a tool box, which is the same as an art bin, but much cheaper. A tool box with a handle and tiered drawers that open out would be ideal for the art materials.